Apparently it’s Squirrel Appreciation Day today. Who knew? As someone who does very much appreciate squirrels, I feel compelled to mark the day. 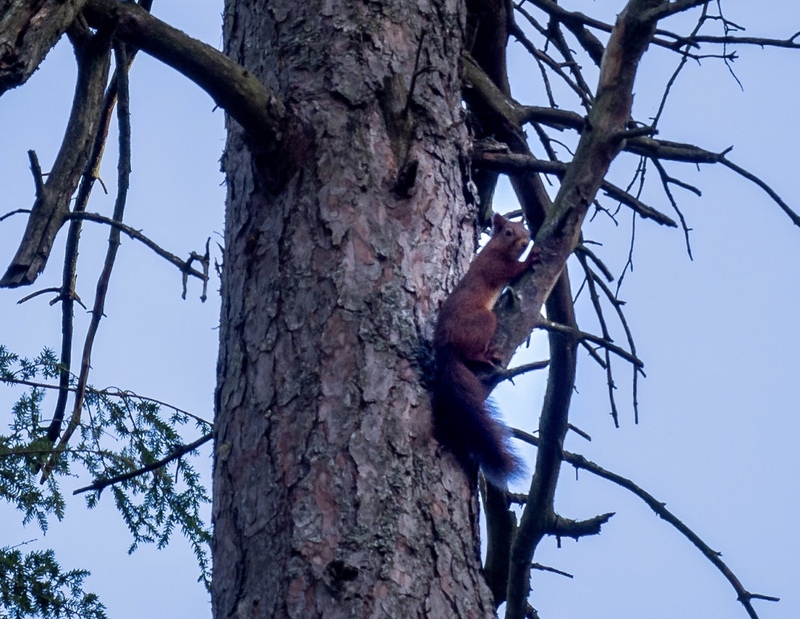 We’re fortunate to live in a part of the UK that still has a population of native red squirrels, and there is a lot of activity in the area aimed at ensuring that they survive and flourish. 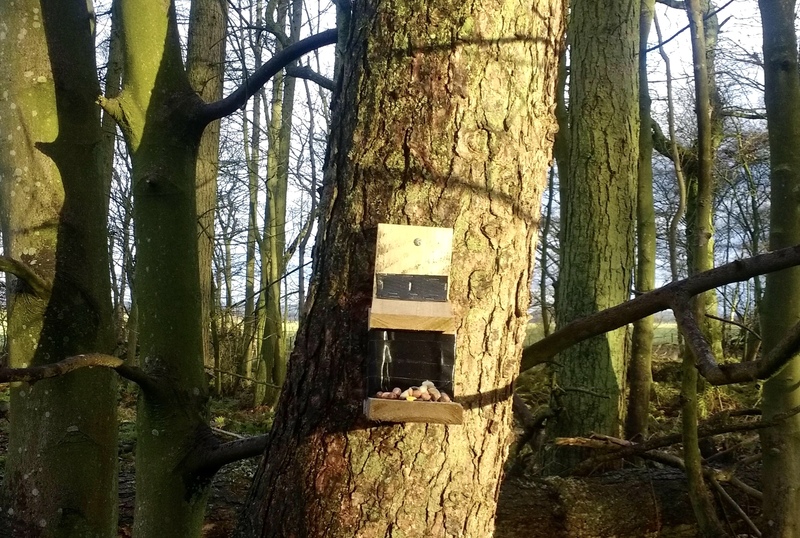 We are responsible for monitoring a squirrel feeder in a nearby copse, on behalf of the Coquetdale Squirrel Group. The wooden box is filled with nuts, and the idea is that the squirrels lift the lid to access the food, and in doing so deposit some hairs on a sticky pad which is placed on the underside of the lid. This does actually work, and we know from analysis done on the pads that the box is being used by a red squirrel, or squirrels. However, monitoring the box has not been as straighforward as we imagined when we volunteered. There is a little square of perspex in the front of the box, and initially something kept pulling this out to access the food. Eventually, I taped it in place. This did sort of work, although the perspex did get severely knawed. The box itself has been replaced twice, having pretty much fallen apart on both occasions. The model in the picture is held together with big screws and lavish quantities of tape, so fingers crossed it will prove a bit more durable. So, let’s all take a few moments today to appreciate a squirrel. Not that the feeling seems to be reciprocated. 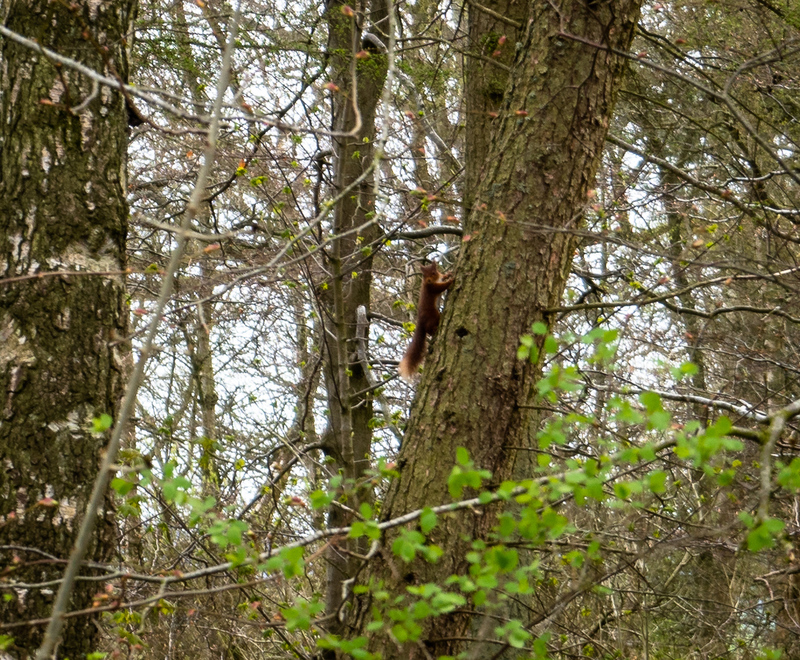 The one time that we saw one in the copse whilst we were walking, it shot up a tree, then turned round and let out a volley of what I can only describe as very aggressive squirrel verbal abuse. Credit for both squirrel photos goes to A Lens in the Landscape. I managed to take the one of the box myself.